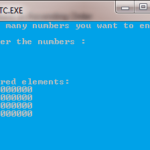 In this program sum and average of of the given numbers are calculated using do-while loop. Do-while loop is a looping condition where statements are executed continuously until the condition validates and test the condition after having executed the statements within the loop. This means that do-while would execute its statements at least once, even if the condition fails for the first time. Scanf() command is used here to allow enter the numbers and sum=sum+num; to sum the numbers within do-while loop. Declare two integers i and n and also initialize i with 0. Declare three floats sum, avg and num and initialize sum with 0. Print the message on the screen to enter how many numbers want to find sum. 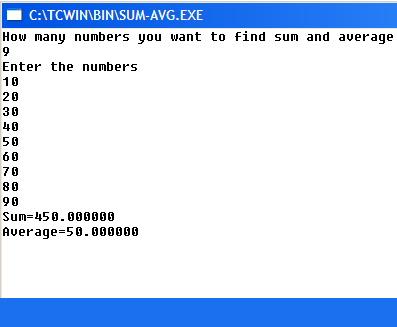 Use do-while loop to insert the numbers calculate the sum and average. after that calculate the average.